Consistent airflow from intake through exhaust is necessary for high level performance, and the BBK Performance X-Pipe can help your 2011+ Mustang GT. Your standard cross-over connection pipe constricts airflow and does not allow your Mustang to perform at its highest level. 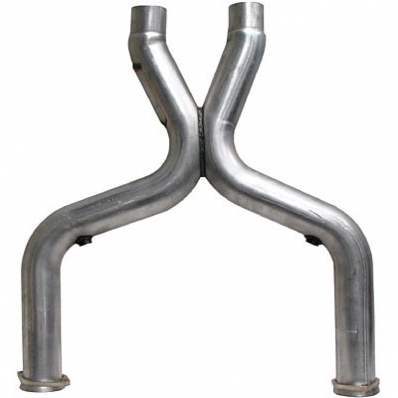 The Short Off-Road X-Pipe is meant to connect to BBK Full Length Headers, creating maximum performance. This X-Pipe is designed with CNC Mandrel-Bending techniques, and has a 3" diameter, with the essential merged X design. Don't let your Mustang GT suffer due to bad airflow, pick up a BBK Performance Short Off-Road X-Pipe and unleash your power today! Call 714-582-3330 or order online to save! The BBK Performance Short Off-Road X-Pipe creates better airflow by allowing the air exiting towards the exhaust redistribute itself to whichever side is less used. In other words, when air gets clogged up on one side the excess air will crossover to the other side of the exhaust system, promoting optimal airflow and performance. It seems like a small modification, but airflow is ESSENTIAL to performance, and when used with the BBK Performance Full Length Headers performance peaks. BBK Performance Short Off-Road X-Pipe for you! Call 714-582-3330 to set up an appointment and save today!